Slope design and the design of slope-retaining structures are common components of D’Appolonia projects. We are frequently called upon to design earth embankments and to assess the cause of failure for existing slopes. Slope failures may be caused by a variety of factors, such as unaccounted for loads, weak subsurface layers, and high levels of ground water in the slope face. Our staff is experienced in planning and executing subsurface exploration programs to obtain soil and rock samples, planning laboratory test programs and interpreting test results, analyzing slope stability using state-of-the-practice software, developing remedial designs, and monitoring the construction of our designs. Remedial schemes might involve removal of undesirable material, flattening the slope angle, constructing a stabilizing buttress, lowering/controlling ground water levels, employing tie-back anchors, using soil nails, constructing a reinforced soil slope (RSS), or other remedial design technique. Through our close association with specialty geotechnical contractors, we are familiar with the application of current construction technologies. D'Appolonia designed the anchors and performed construction monitoring for this slope remediation project adjacent to the Ohio River near Pittsburgh, Pennsylvania. D’Appolonia designed a retaining system to stabilize a landslide that had severely damaged a street in the City of Pittsburgh. The system selected for implementation provided cost and constructability benefits over other alternative considered. Instrumentation has indicated negligible movement since the stabilization work was completed. D’Appolonia was the lead designer for a design/build team selected by the U.S. Army Corps of Engineers Vicksburg District to develop a stabilization plan for a loess bluff along the Mississippi River. The stabilization plan consisted of a combination of soil nail and prestressed tieback anchor walls along with a mechanically stabilized earth (MSE) wall that was constructed with light weight fill. 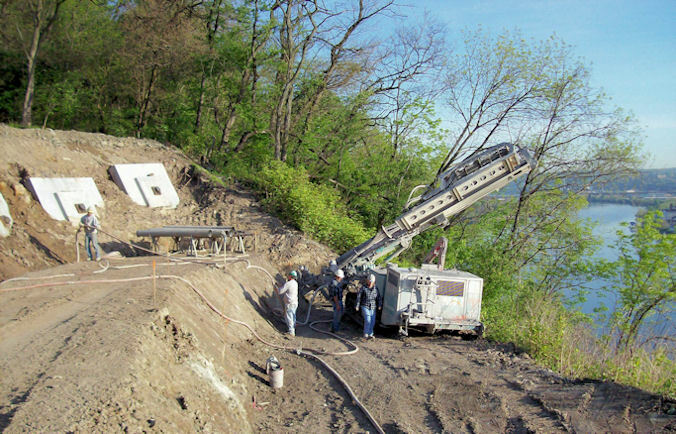 D’Appolonia has completed more than 100 individual projects for the City of Pittsburgh under open-end geotechnical engineering service contracts. These projects have included design of retaining walls, roadway embankment stabilization, and stabilization/repair of landslides. As part of an open-end contract for the U.S. Army Corps of Engineers, Memphis District, D'Appolonia was retained to conduct preliminary analyses of alternatives for stabilizing a 100-foot-high loess bluff near Hickman, Kentucky and to prepare plans and specifications for construction of the remedial alternative selected by the Corps of Engineers. D’Appolonia was retained to stabilize a rock slope over a tunnel entrance in Pittsburgh, Pennsylvania. The scope of work included removal of unstable rock overhangs, construction of an anchored concrete bulkhead, and protection of the rock face with reinforced shotcrete. D'Appolonia prepared detailed plans and specifications and provided full-time construction monitoring and consultation during the remediation effort. D’Appolonia was retained to perform a site reconnaissance, to develop repair schemes for landslides affecting an access road, to prepare plans and specifications for the selected alternative, and to provide construction monitoring services for stabilization of a slope supporting a microwave tower access road. D'Appolonia provided consulting geotechnical engineering services to Westmoreland County, Pennsylvania for the planning, design and construction of a $30 million correctional facility. The scope of work included design of drilled-shaft foundations and design of a 600-foot-long mechanically stabilized earth (MSE) retaining wall. We provided full-time construction monitoring services for the project. D’Appolonia conducted comprehensive exploration and analyses of the earthen embankment for Rush Reservoir, a municipal water supply impoundment located near Rochester, New York. The purpose of the study was to address problems related to embankment stability and excessive seepage. D’Appolonia developed design recommendations for a buttress and an internal drain system. D’Appolonia was retained to evaluate the stability of the dredged slope at the Charleston Naval Weapons Station under seismic conditions. The results of the analysis indicated that the slope would be unstable under earthquake loading and a maximum potential displacement was calculated. This displacement was subsequently accounted for in the design of mooring structures.